"I am a volunteer," he said. "I am going to help the farmers with the harvest - full of patriotic enthusiasm." "They call me the girl who works well," went the lyrics. "They call me the girl who works faster than the fastest horse." 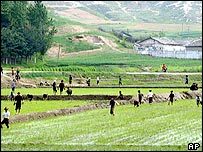 All this is part of what observers say is a concerted push by North Korea's isolated regime to boost domestic food production, in a country where a third of the population is chronically malnourished. It may be working. According to some predictions, this year's harvest will be 10% larger than in 2004. But that will not be enough, warned the UN World Food Programme's country director, Richard Ragan. "North Korea is chronically food insecure, so it's unlikely in the near term that it will ever produce enough food," he said. But all that is about to change. North Korea's heavily politicised drive for a bigger domestic harvest has been coupled with a new and more controversial move to end international food aid, and restrict the number of foreign aid workers in the country. Although the details are being negotiated, all the WFP's food plants are due to close within the next month. "North Koreans are proud people," said Mr Ragan. "They don't want to create a culture of dependency, which makes a lot of sense. "But there are still real humanitarian needs here, and it remains to be seen now they deal with them." 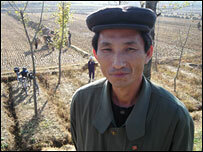 But North Korea's most vulnerable groups are now facing a period of uncertainty. A key concern is how food will be distributed, and whether the army's needs will be put ahead of the rest of the population. High inflation recently prompted the authorities to abandon a market system for grain distribution, in favour of the old state-controlled policy - which the WFP has described as "inoperable".